A very simple rule when borrowing will have you owning more of an investment property from day one. Property has been a terrific investment, but it’s also been an easy one. Those who bought well have seen values pushed upwards as interest rates dropped away. They would have had no idea a decade or two ago how much monetary policy would play into their hands. As rates dropped, borrowers asked for more and more. It also became far cheaper for the banks to borrow, and so there was more and more money to lend. Property values in the major capitals have been pumped up to popping point. New entrants should be careful. Like any investment, a purchase should be considered for its yield and the potential for capital growth. In cities such as Sydney and Melbourne, rental yields are below the capitals average of 3.7%. That’s a bad starting point, and in a market which has been growing so strongly. Sydney dwellings are 15% more expensive than one year ago. For Melbourne, prices have gained 9% in 12 months. It’s crazy to expect values to increase at the same rate. In this market, growth can’t be expected as compensation for low yield. An investment in property usually relies on heavy gearing, and this is where buyers can gain an advantage in a market which isn’t obviously attractive, like this one. The temptation for most borrowers is to negotiate as long a term as possible, as payments will be lower. The common mortgage these days lasts 30 years. It’s interesting that lenders never seem to put up resistance to keeping a relationship with a debtor for so long. In the real world, a creditor would want to be repaid sooner rather than later. But as the term of a loan extends, the part of every payment which is interest grows and the part which is reducing the principal shrinks. Now, a property investment requires lots of borrowing, and owners expect capital growth to compensate them in the long run. As time passes, the advantage to them is the difference between the asset’s market value and the principal amount still owing to the lender. If owners want to accelerate that advantage, they should negotiate as short-term a loan as they can afford. The chart shows the interest component as a percentage of a loan payment when $600,000 is borrowed at 6%. For a 30-year loan, 83% of the first payment is interest. 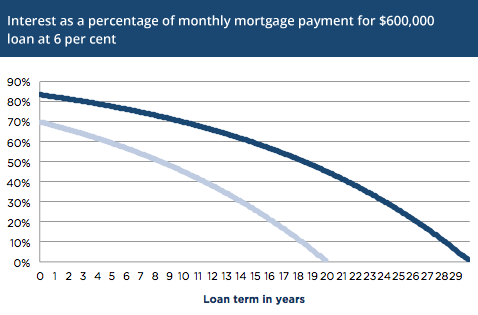 For a 20-year loan, 70% of the first payment is interest. That’s a big difference, and the payments will of course be higher, but the borrower is paying down principal at a much faster rate from the outset. Lenders are pretty quiet about this phenomenon. That’s easy to understand. To them, the risk of a borrower defaulting lasts from day one to the final payment, so the embedded reward of interest making up more of every payment would seem fair. And the institutions haven’t done any funny gearing to the rules of mathematics to arrive at this equation. It’s just how it is. A borrower who wants to get an advantage should go for as short a term as is affordable. A lender will know they’re dealing with a smart cookie.